Contributor: Malcolm Sambridge, RSES Australian National University, Malcolm.Sambridge@anu.edu.au. 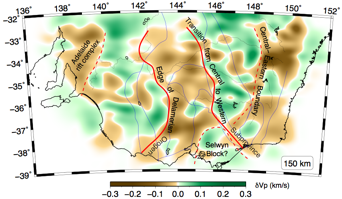 Tomographic imaging of the Earth’s internal structure has been a major pursuit of seismologists for more than 35 years. Using information from many recordings of earthquakes images are reconstructed of variations of Earth’s seismic properties as a function of position within the globe. Figure 1 shows variations of seismic shear wavespeed throughout the Earth’s mantle produced by inversion of a large number of multiple-frequency long period travel times from globally distributed earthquakes to surface receivers. Blue regions represents rocks with faster than average wavespeeds and orange represent slower than average wavespeeds. Through such inversions information is produced on the present day internal structure of Earth which in turn places constraints on mantle dynamics and composition. Our group at ANU, in collaboration with colleagues around the world, develop new approaches to seismic imaging and apply them to the ever increasing database of local, regional and global recordings of earthquake waveforms. A focus of the ANU group is in imaging regional structure of the Australian continental lithosphere (0-300km depth) collected by deploying seismic stations across the continent. Figure 2 shows a recent result using local recordings of distant earthquakes. Inversion problems of this type usually reduce to the solving of a large system of linear (or linearized ) equations simultaneously. A large body of work exists on methods of solution and seismologists use different techniques depending on the number of data and whether the mathematical relationship between data and unknowns is linear or nonlinear. We are constantly trying to improve these methodologies as well as extending our data. 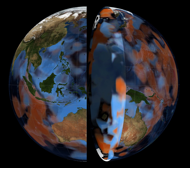 Collaborators: Christophe Zaroli (Universite de Strasbourg), Eric Debayle (Universite de Lyon), Nick Rawlinson (University Of Cambridge), Brian Kennett (ANU) plus entire ANU Seismology and Mathematical Geophysics group. Zaroli, C., Debayle, E. and Sambridge, M, Geophys. J. Int., in press, 2010. P. Arroucau, N. Rawlinson, and M. Sambridge, GRL, vol 37, L07303, 2010.